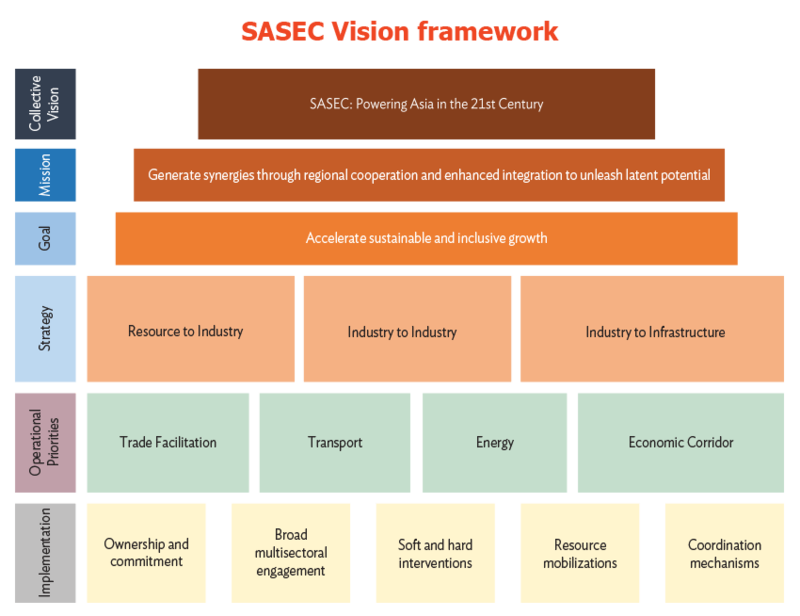 SASEC Powering Asia in the 21st Century defines the SASEC Vision by articulating shared aspirations of the SASEC countries (Bangladesh, Bhutan, India, Maldives, Myanmar, Nepal, and Sri Lanka), and setting the path to achieve these through regional collaboration. Resource to industry links. Leveraging natural resource-based industries by tapping into latent industrial demand within the subregion. Industry to industry links. Promoting industry-to-industry links within the subregion to develop and strengthen regional value chains and enhance the region’s competitiveness. Industry to infrastructure links. Expanding the region’s trade and commerce by providing access to regional and global markets through the development of subregional gateways and hubs. The SASEC Operational Plan 2016–2025 presents the strategic objectives of the SASEC partnership, and the operational priorities of the four main SASEC sectors—transport, trade facilitation, energy, and economic corridor development. Promoting synergies between economic corridors being developed in individual SASEC countries, and optimizing development impacts of these economic corridor investments through improved cross-border links. Many of SASEC’s existing pipeline of projects were drawn from the South Asian Association for Regional Cooperation (SAARC) Regional Multimodal Transport Study, SAARC Regional Energy Trade Study and the Bay of Bengal Initiative for Multisectoral Technical and Economic Cooperation (BIMSTEC) Transport Infrastructure and Logistics Study driven by the shared common aspiration between SAARC, BIMSTEC, and SASEC for an integrated and prosperous Asia. These projects were revisited, aligned, and supplemented to reflect the emerging needs and priorities of the SASEC countries. The Operational Plan steps up cooperation within the region, as relationships among countries grow and deepen. These sectoral strategies align each SASEC sector to the goals of SASEC, and reflect the overall focus of each sector. Build capacity to support the use of modern techniques and international best practices and enhance regional cooperation and coordination mechanisms among stakeholders involved in trade facilitation. Facilitate bilateral and regional coordination mechanisms and knowledge sharing such as technology transfer development practices toward the regional power trading market. Designing appropriate institutional mechanisms to serve as platforms for coordination and collaboration among the government and various stakeholders involved in ECD.